More than 25 years ago, RE/MAX began its partnership with Children’s Miracle Network Hospitals. Each year, August serves as a month-long celebration to share all of the amazing things RE/MAX agents and offices do to make a difference in kids’ lives in our community. Last year, Bay Area RE/MAX agents and offices raised over $43,000 to help patients and families at UCSF Benioff Children’s Hospitals. The impact of that support at our hospitals is tremendous- $43,000 can cover 27 ambulance rides, 4 charity cases, or 18 emergency department visits. 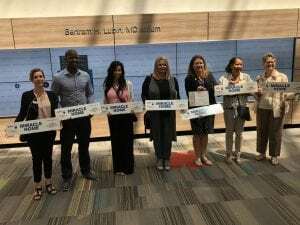 Last week, UCSF Benioff Children’s Hospitals hosted an Open House at the Oakland campus to recognize many of the local agents who have been strong supporters of our hospitals. As of July 2018, we have 9 Miracle Agents and 4 Miracle Offices. To reach Miracle status, an agent must donate $500 or more in a calendar year and an office must collectively donate over $2,000 in a calendar year through the Miracle Home Program. We have continued to see more and more Bay Area agents and offices participate in the Miracle Home Program and we are excited to see all of the amazing ways these donations can help the children at our hospitals this year. Thank you, RE/MAX, for all of the love and support of UCSF Benioff Children’s Hospitals! You are truly making a difference in our patients’ lives!